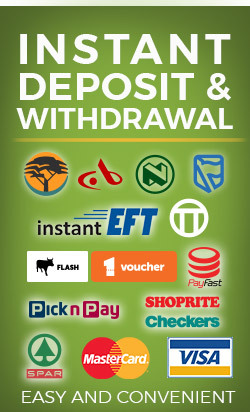 To qualify, the user must have successfully registered an account with EaziBet.co.za and made a minimum deposit of R100. You need to turn over your initial deposit once at minimum odds of 1.5 before you qualify to receive the First Deposit Bonus. The maximum bonus amount that can be claimed is R600. This offer is valid until the 30 April 2019 and all valid customers must claim their bonus before this time. Bonuses will be awarded within 48 hours of qualifying. Once qualified, we will automatically add your bonus. This offer only applies to first deposits. Registration applies as a one-time offer, if you delete your account and re-register, the promotion does not apply. The bonus amount must be wagered at least 5 times at minimum odds of 1.5 before any withdrawals can be processed. Free Bets or bonus money received cannot be used in SP Bets, Tote Bets or Lotto Bets. EaziBet has the right to cancel or withdraw the First Deposit Match Bonus or change any of its terms after informing the Western Cape Gambling & Racing Board. The First Deposit Match Bonus is designed for recreational accounts only and will be attributed accordingly. Any accounts deemed to be non-recreational and attempting to abuse the nature of the First Deposit Match Bonus will be voided without hesitation. EaziBet's decision in this regard will be final. EaziBet reserves the right to reject all payouts and cancel all bets made with any bonuses if it considers that any fraud, breach of the terms or bonus abuse has been performed. Abuse of this promotion may result in the user being banned from our website and services. All participants have the ability to approach the Western Cape Gambling and Racing Board in the event of a dispute. How Do You Claim Your Refer-a-Friend Bonus? R150 will be deposited into your Bonus Account for each qualifying friend that successfully registers and meets the criteria. To refer a friend, you must have a valid EaziBet account, and have deposited at least R150 and staked a minimum of R150 (excluding bonuses) since signing up your account. Your referred friend must have no other EaziBet account. The same email address as the one submitted to info@eazibet.co.za must be used to open a new account or the offer is null and void for you. The R150 bonus for you has a play through requirement of x 5 at minimum odds of 1.5. The R150 bonus will be credited to your account within 48 hours of becoming eligible. The Refer a friend bonus only applies to the first 5 friends you refer. All referred friends must be aged 18 years or older. EaziBet has the right to cancel or withdraw the Refer-a-Friend Bonus or change any of its terms at any time and without cause or notice. EaziBet reserves the right not to allow certain account holders to take part in the Refer-a-Friend Bonus without due cause or notice. EaziBet reserves the right to refuse referred friends from opening accounts. EaziBet is the sole arbiter of this promotion and its decision is final and binding. The Refer-a-Friend Bonus is designed for recreational accounts only and will be attributed accordingly. Any accounts deemed to be non-recreational and attempting to abuse the nature of the Refer-a-Friend Bonus will be voided without hesitation. EaziBet’s decision in this regard will be final. In case of suspected manipulations or fraud, and in case of any violation of these conditions of participation, EaziBet reserves the right to exclude any account holder or referred friends from participating in the Refer-a-Friend Bonus. In such a case, the account holder or referred friend loses any right to claim a bonus. Accounts belonging to the same family and/or household. Accounts sharing a common contact detail or identifier (e.g. email address). Accounts accessed from the same computer. Multiple accounts belonging to the same person. Breach of any of our bonus terms and conditions. Evidence of collusion between customers in placing of bets. The General Rules of EaziBet shall also apply to the Refer-a-Friend Bonus. The 'Bonus' is a cash value and contains no T&Cs once received. All promotions, bonuses or special offers are subject to promotion specific terms and conditions. Any bonus or promotion must be used in line with such T&Cs in order to be eligible to receive the bonus or promotion. Unless otherwise stated, turnover requirements of 5x at a minimum price of 1,5 applies. EaziBet reserves the right to withdraw any bonus offer or promotion at any time, for any reason without previous notification. Only one bonus per person, per family member, per household address, per email address or per IP address unless Bonus specific terms permit more than one claim. Bonus funds cannot be used to place bets on the Jackpot or Lucky Numbers. Clients can be awarded bonuses from multiple different advertised promotions on the same day or within any period. If bonuses are awarded under different Bonus promotions, they may not be combined and in such a case will queue in different bonus wallets. The client will only be allowed to access one bonus wallet at a time. E.g. If you receive a ‘First Deposit Match bonus and claim the ’Stake Back Promo’, you will have two separate bonus balances which operate independently. The playthrough requirements will also stack meaning that the playthrough required before withdrawing will be the multiple of the TOTAL bonus awarded to the client in that week, irrespective of whether the bonus was awarded in parts or together. All Bonuses expire 14 days from award unless Bonus Award T&Cs for the relevant bonus state otherwise. Bonus Award expiry dates may be extended beyond 14 days or the relevant Bonus T&C’s stated expiry terms by EaziBet in its sole discretion. All references to weeks in all EaziBet’s various T&Cs are to mean calendar weeks as generally defined. SMS, Email and Social Media Bonuses are valid for different lengths of time. Please speak to our Support Team for more info on any bonus enquires you may have. EaziBet may from time to time, award bonuses to clients or send clients Deposit Match offers via SMS or Email. The max amount that can be claimed, unless otherwise stated is R700. By being an account holder with EaziBet, clients automatically opt into bonus and promotional offers, however on certain occasions we may require clients to enter a code to opt in. If clients wish to opt out of such offers, they need to contact EaziBet support and request to be removed. To qualify for the bonus, the customer must have received an offer directly from EaziBet informing them of the promotion. The Free Bonus is valid for a period of 7 days, if bonus money balance has not been withdrawn to the real money wallet after meeting the rollover requirements within this time the bonus will be forfeited. The Free Bonus will need to be rolled ove (wagered) at most 5 x the value of the initial bonus awarded at minimum odds of 1.5 before any withdrawal will be processed. Bonuses carry a rollover requirement of 5 x at a minimum price of 1,5. Bonus Offers will be automatically credited within a timeframe specified in the promo. Only one bonus can be active per person, per family member, per household address, per email address or per IP address at any one time. To qualify, all legs of the multiple must be placed in the 3-way Match Winner market. Each qualifying leg must be odds of 1.5 or greater. A maximum refund of R250 will be credited per week but this can be split across multiple bets. Once the bonus is received, it needs to be wagered 5x at minimum odds of 1.5 before any withdrawals from the relevant bonus wallet can be processed. Bets on lotto do not apply. 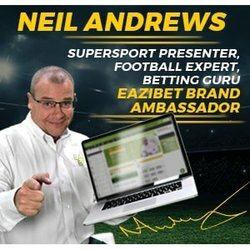 EaziBet has the right to cancel or withdraw this promotion or change any of its terms after informing the Western Cape Gambling & Racing Board. This promotion is designed for recreational accounts only and will be attributed accordingly. Any accounts deemed to be non-recreational and attempting to abuse this bonus or abuse this bonus in combination with other promotions will be voided without hesitation. EaziBet's decision in this regard will be final. Abuse of this promotion may result in the offender being banned from our website. To qualify, clients need to place a minimum of one bet on each day of a calendar week (Monday till Sunday). Bets placed during the calendar week which are finally resulted as either void or cancelled bets unfortunately will not be included. Clients will be awarded the value of their lowest stake from the previous week as a bonus up to a maximum of R100 per client per week. Abuse of this promotion may result in the user being banned from our website. To qualify, day 1 is Monday and day 7 is Sunday and you need to place a bet every single day.